On their own, the average viewer creates a bundle with 9 networks, at a cost of $66 per month. Hub’s new study, “Let’s Get Ready to Bundle,” confirms that consumers would prefer a TV service model where they select, and pay for, only the individual networks they’re most interested in watching. How do consumers want to pay for TV? 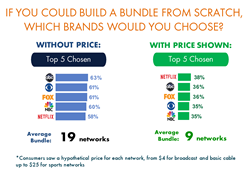 Respondents’ saw seven different potential structures for TV bundles—including the traditional pay TV approaches that exist today, and several variations of “a la carte” network bundles. More than half (53%) preferred a pure à la carte approach—where consumers can pick the networks they want, and pay for each one individually. By contrast, only 38% of consumers find the current status quo approach appealing—subscribing to tiers or groupings of networks, including networks they watch and networks they don’t watch. Survey respondents saw a list of 77 TV content brands—including broadcast, basic cable and premium networks, and the three major SVODs: Netflix, Hulu and Amazon. “Let’s Get Ready to Bundle” was conducted among 1,500 US consumers with broadband and who watch at least 5 hours of TV per week. The data was collected in January 2017.An infographic and excerpt of the report are available as a free download from Hub Entertainment Research.